The French Horn, featuring Professor Philip Farkas, was originally produced and released in 1984 by William G. Paulick for The Brass Emporium (Juneau, Alaska). The IHS has purchased the rights to this video as a service to its members, and divided the original two-hour video into eleven segments corresponding to the original eleven "lessons" filmed by Paulick. 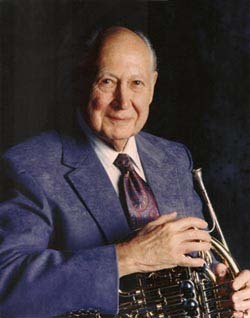 The opportunity to hear the thoughts of such a luminary of horn history provides wonderful insights into why Philip Farkas, a legend in the horn world as a player and teacher, was so respected. As one will see, his warm personality is more evidence of why so many of his students loved him and appreciated his wisdom and guidance. Those who are familiar with Farkas's seminal book, The Art of French Horn Playing, will find some familiar themes (well, it is the same person! ), but the chance to hear these "pearls" directly from the source is heart-warming and even more profound. The IHS Advisory Council hopes that members will appreciate this service and encourage students and other younger generations to get in touch with a part of horn history. Videos are for IHS Members only. Please log in to see them.